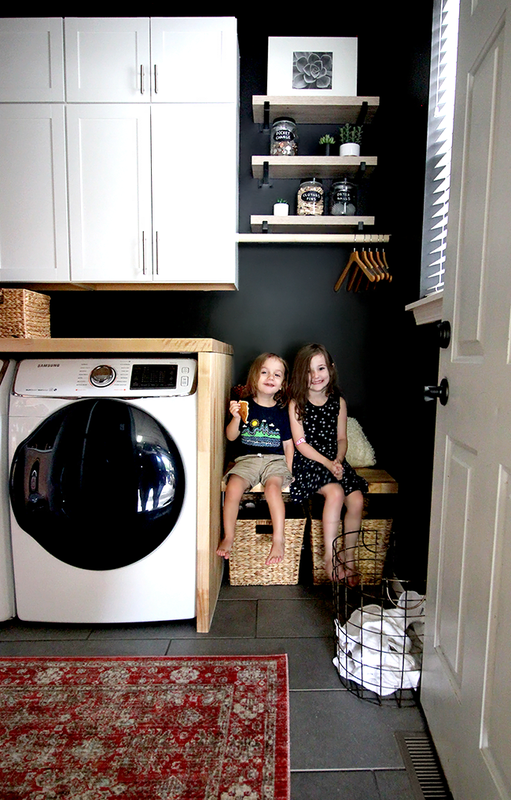 Bubby and Bean ::: Living Creatively: Our Laundry Room/Mudroom Remodel Reveal! 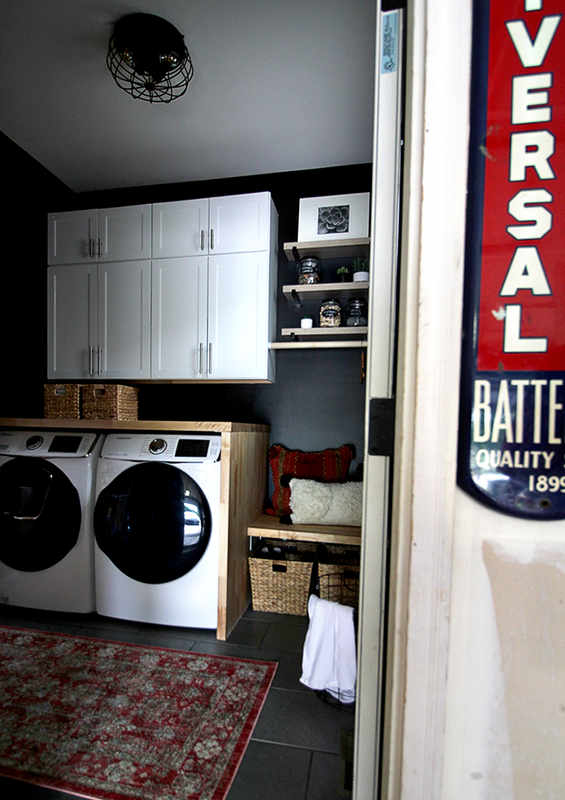 Our Laundry Room/Mudroom Remodel Reveal! 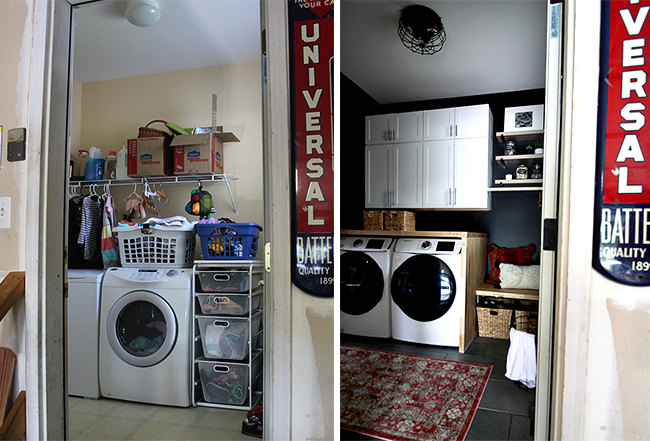 You can see from these before photos that the original laundry room severely lacked storage (stay tuned for a more specific post on the storage aspect of the space and how we came up with solutions for it). There also wasn't anywhere for us to fold laundry, so we were dragging loads upstairs to fold on our bed. (Which - let's be real - often resulted in balls of wrinkled clothing that got repeatedly pushed to the bottom of the to do list.) 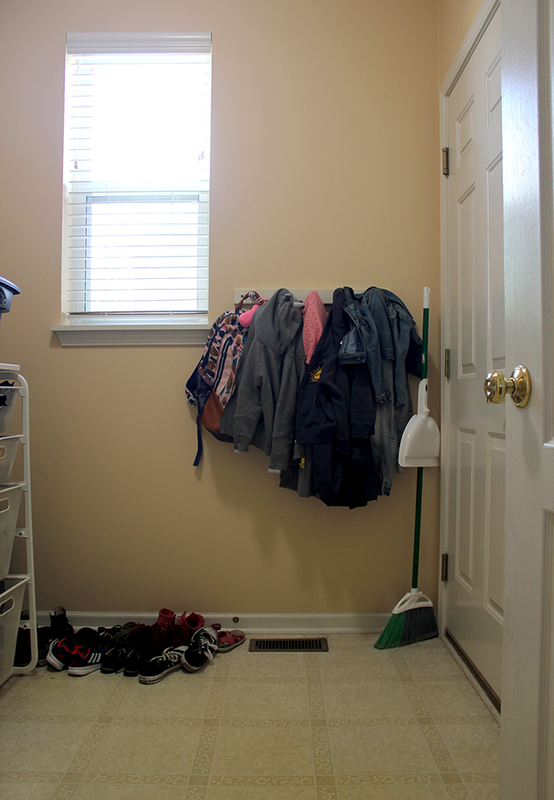 The space also didn't have the essentials to make it a mudroom, something that we felt was important to our home. 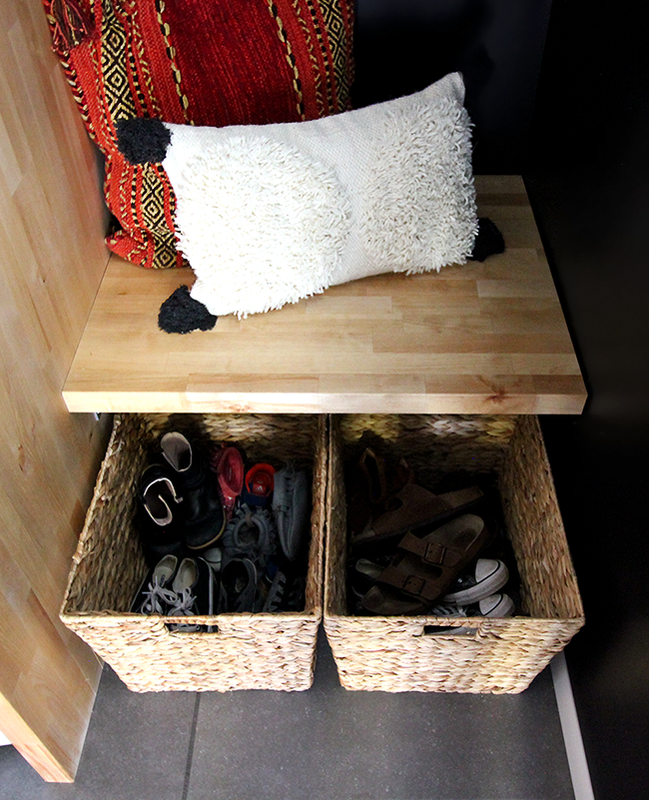 Because we enter our house through the garage, we needed a bench or some sort of area for the kids (and us, and guests) to take off their shoes, and proper storage for the shoes. We decided that in order to really transform the room into what we needed, we should strip it completely and start from scratch. The first thing Robbie and I did was sit down and put together some mood boards and (admittedly very amateur, but still useful) renderings of a new design for the space. I am the visual/artistic person in our relationship, and Robbie is the practical/numbers person. So I created a color scheme (black, white, gray, and wood, with pops of deep red) and sketched out design ideas, and Robbie determined placements and measurements. We also made a list of the things we would need to do in order to make the space best suited for our family: replace the old linoleum floor with durable tiles, build a counter for folding, build a bench with an area for storage, add two rows of cabinets for storage, add shelves for storage and visual appeal, paint the room a darker color, replace the light fixture, replace the old washer and dryer with newer models that actually worked (! 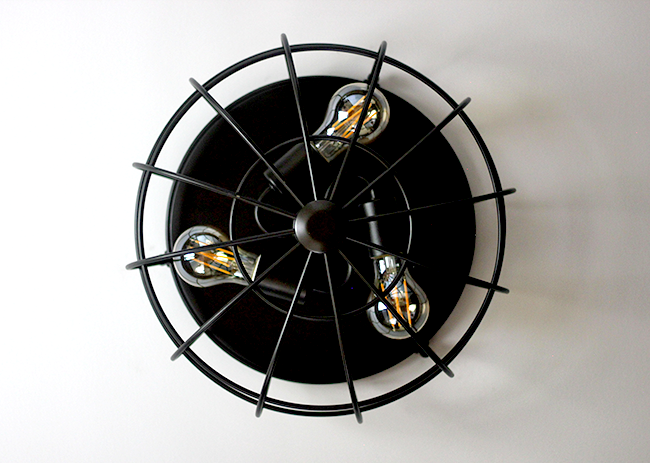 ), and add accessories that would allow the space to be more inviting as we entered our home. Once we had a specific plan for the room, it was time to head to Lowe's and Lowes.com to shop for all of the necessary products and tools. This was one of the most fun parts of the project for me. Getting to take my mood boards and sketches and make them a reality by finding the exact items we needed to bring the space to life was the best! It was slightly daunting too - many of the DIY projects we'd be tackling were completely new to us (neither of us had ever installed tile or built counters or benches), and we needed to keep the entire project within a budget of $5,000 - so I was nervous that I'd get the wrong tools or materials. In the end, we were able to complete it within budget, and because we literally did everything ourselves, we learned so much along the way that we'll be able to put to use for future home projects. Next up was demo day! Okay, so we didn't really demo anything. 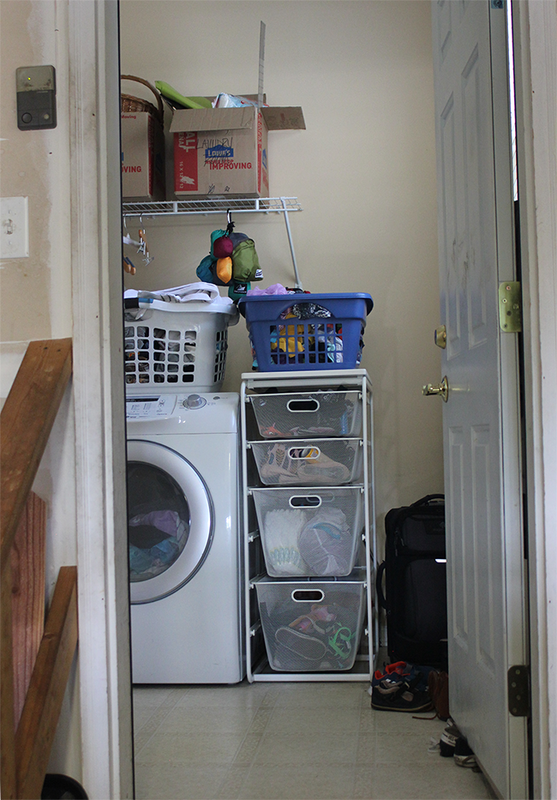 But we did remove the old washer and dryer, take down the current wire shelving that was on the wall, remove the current coat rack, and pull up the linoleum floor. 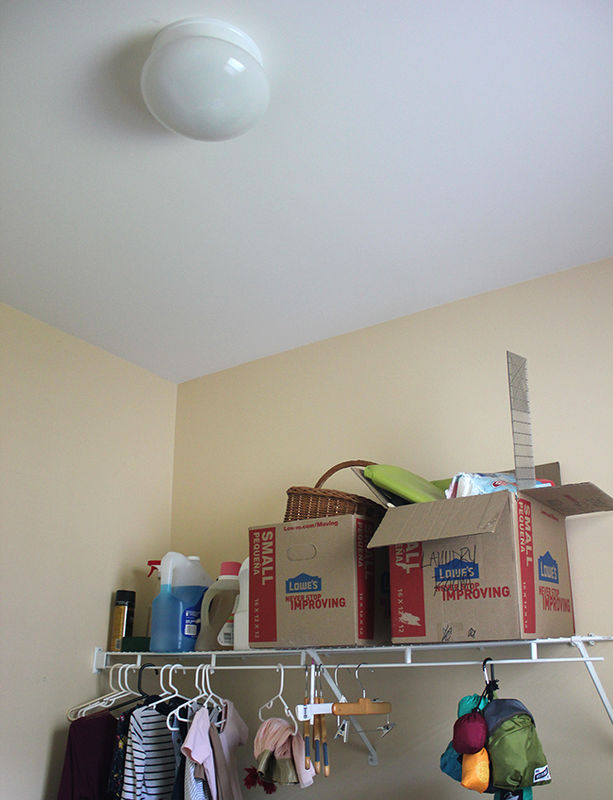 Once everything was out and the space was clean, we were ready to get started. Robbie was only off the road with the band for two and a half weeks, so we were motivated to dive right in. 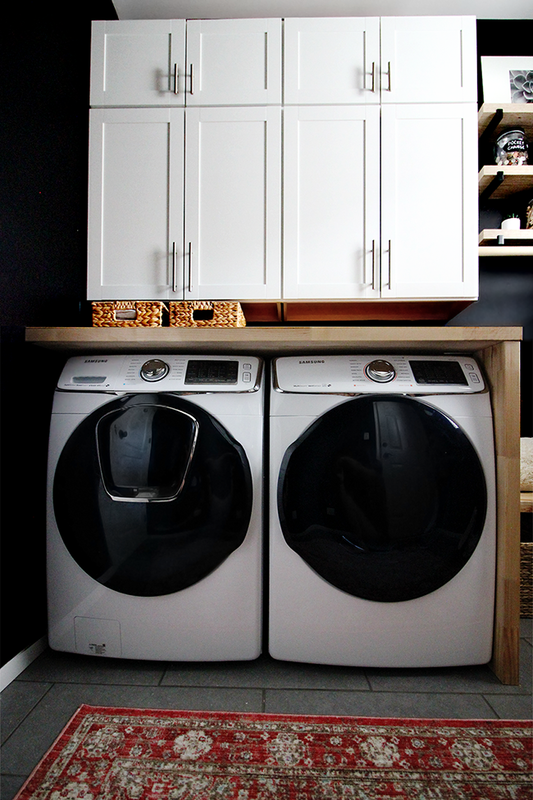 We did the majority of the work at night after the kids went to bed, and although that meant lots of 3 AM bed times, it's proof that even without a lot of free time, a remodel like this can be done fairly quickly with the right products and tools. Next up came painting the room. Moody paints are really on trend right now, and I wanted to take the plunge (my paint comfort zone is usually limited to white or gray), but I also wanted something that would stand the test of time. 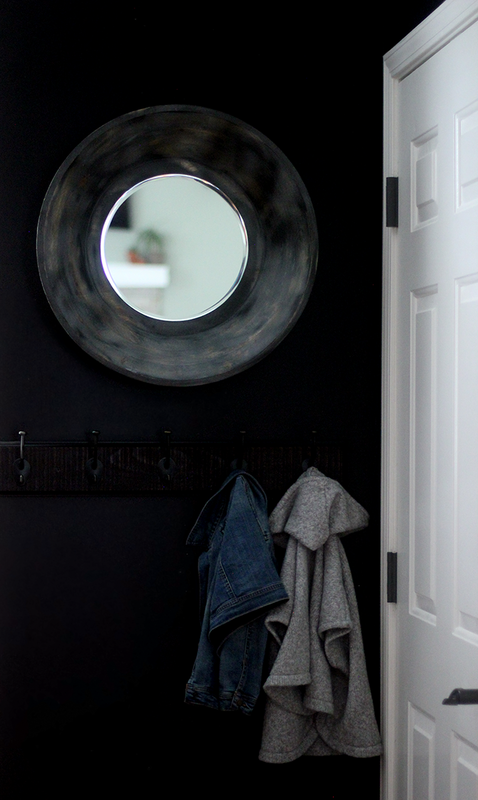 I discovered the most gorgeous black (called Caviar) by HGTV Home by Sherwin-Williams, and opted for that in an eggshell finish. 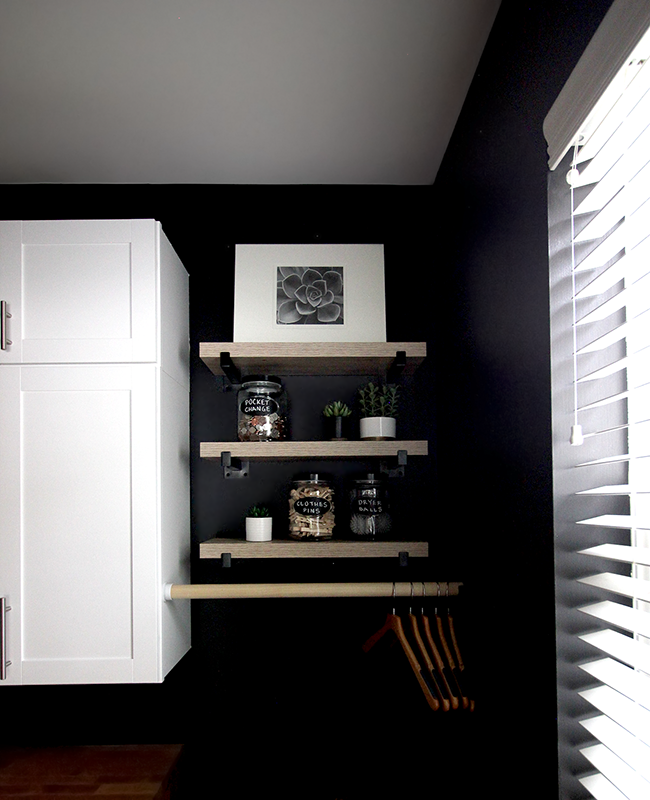 I was admittedly a little nervous to do the room in black because it's already so small, and was amazed to see that it ended up creating the opposite effect - the room looks much larger with the dark paint. I love it so much that I'm planning on getting the exact same paint for our downstairs bathroom. After the painting was complete, we recruited my dad to help us hang the cabinets and shelves. 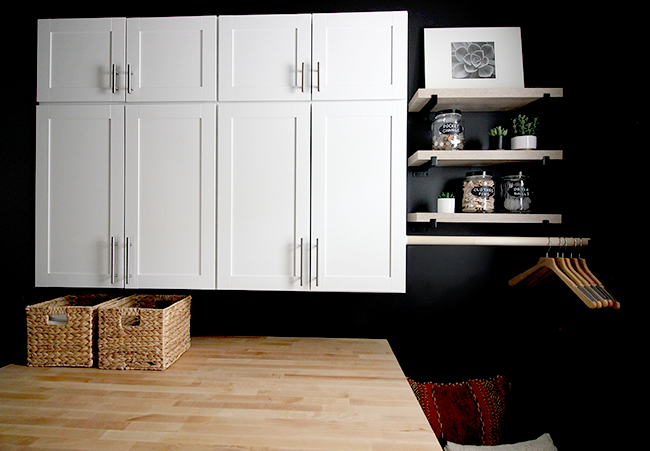 Because creating storage was one of the biggest motivations behind this remodel, I'll be sharing another post soon with the details on how we installed the cabinets and shelves, along with other ways we designed more storage for the space. For now, here are cabinets and shelves we chose (I wanted simply designed, white cabinets to create a contrast against the black paint and to flow with the white appliances, doors, and trim in the room, and some sort of wood style shelves to complement the butcher block), along with the items used to install them: large cabinets, small cabinets, cabinet pulls, shelves (with hardware and brackets), wood veneer shelves, shims, a standard drill and screws that we had on hand, this stud finder, and this level. 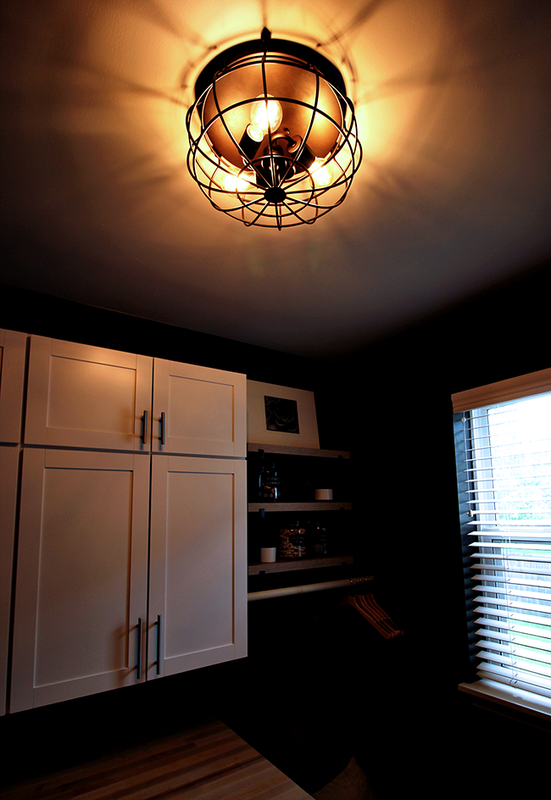 Next we switched out the old light fixture for this one (I am obsessed with it) and these light bulbs, and changed out the brass door knobs for aged bronzed ones and brass hinges for black ones. I actually hadn't even thought of changing the hardware on the doors, but once the room was almost finished, the brass just didn't flow well. And the change was an easy fix. We then hung a new wall-mounted coat rack and this super unique pothole mirror. 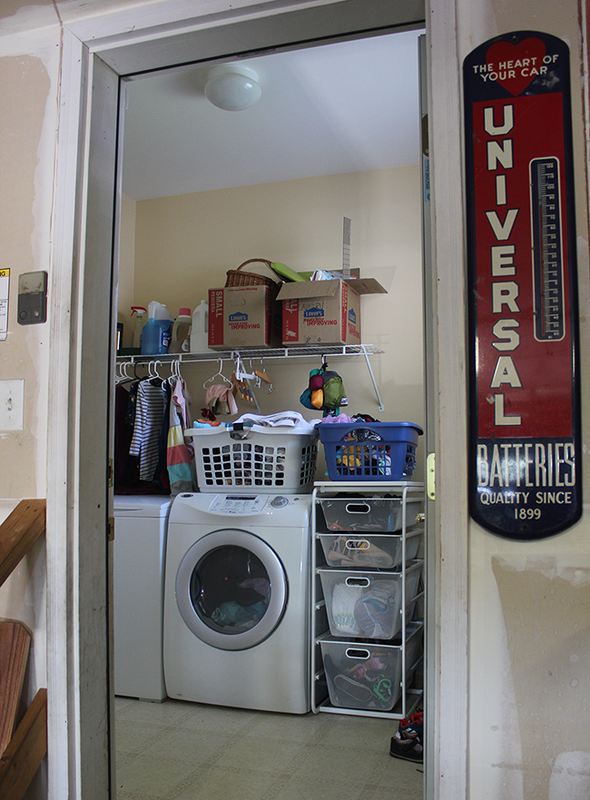 We also cut down a dowel rod and used white shelf brackets (we painted one black) to made a laundry rod for hang drying clothes. Once everything else was finished, I completed the shelves with some storage jars I had on hand for clothes pins, dryer balls, and pocket change (you can make similar ones with mason jars and chalkboard paint, or get these cool vintage looking storage jars), some succulents, and a photograph that my dad took with one of his film cameras, developed, and hand-framed. I added this red throw pillow and this ivory one (which I love so deeply I plan on getting a few more for our family room) to the bench, and this absolutely beautiful oriental throw rug to the floor. I also picked up this antique style bronze basket for transporting laundry to and from upstairs. Dreaming of, designing, and remodeling a space in your home is such a rewarding experience - we get to enjoy our work every single day! And we're very inspired to remodel more rooms in home now that this one is complete. If you have any questions about the process of our redesign, please let me know. I'd be happy to answer! 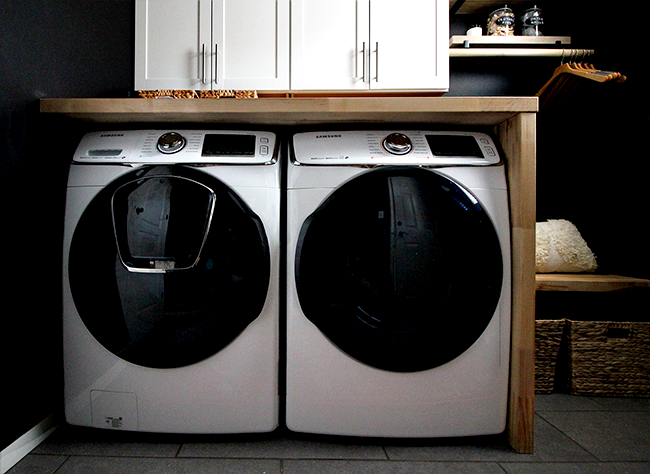 Huge thanks to Lowe's for partnering with us on this project and post! WOW! This is absolutely stunning! Can you come redo mine too? Amazing transformation! 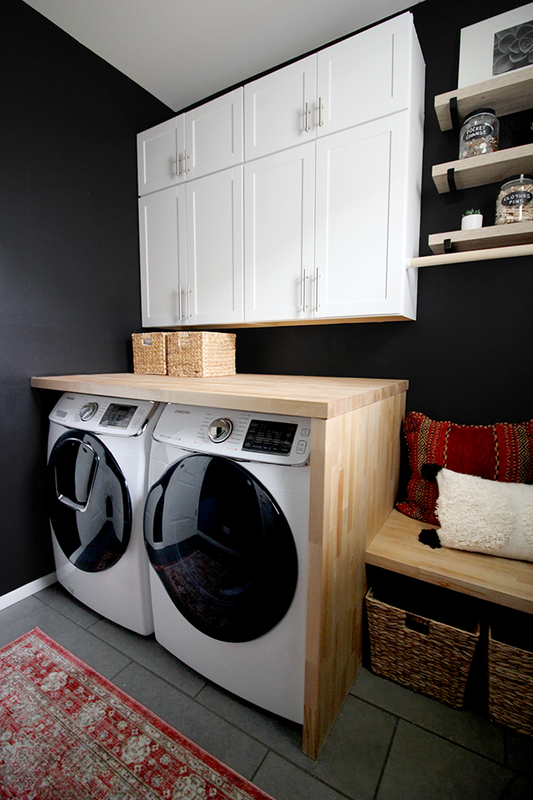 This is so beautiful, I would love to do the same to our laundry room. That is a huge transformation! It looks amazing! Motivated to do mine too. I have a small laundry room with CONS: outdated floors, unpainted cabinets, old washer/dryer; and PROS: closet, raised 4-door cabinet over washer/dryer, and a new window with a beautiful view of our white pines. I feel this could be an easy update to draw attention if we sell our house. Have you ever used something easier than tile for flooring? Maybe a stick-on something? I'll be doing my work solo for the most part and don't want to take on anything too difficult. Also, the dark paint makes me super nervous. 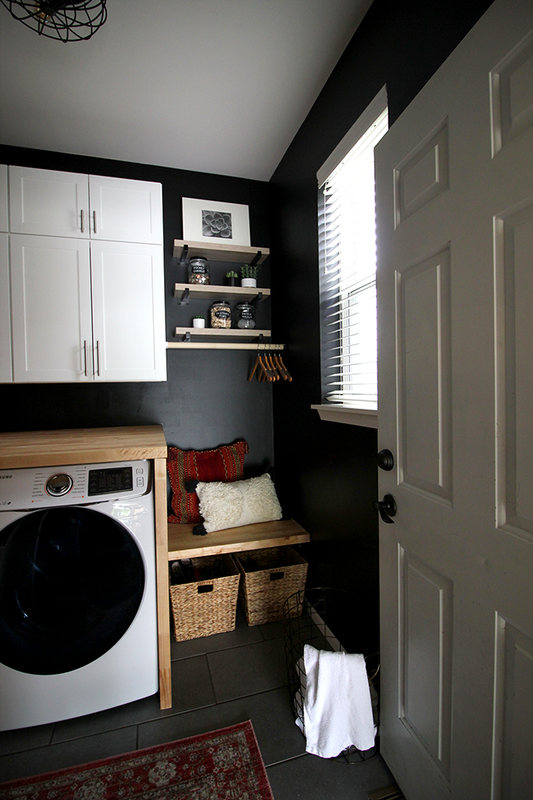 Our laundry is on our top floor, right at the top of the stairs, and you see directly out of the window when looking in. Maybe dark wouldn't work for this. What are your thoughts? 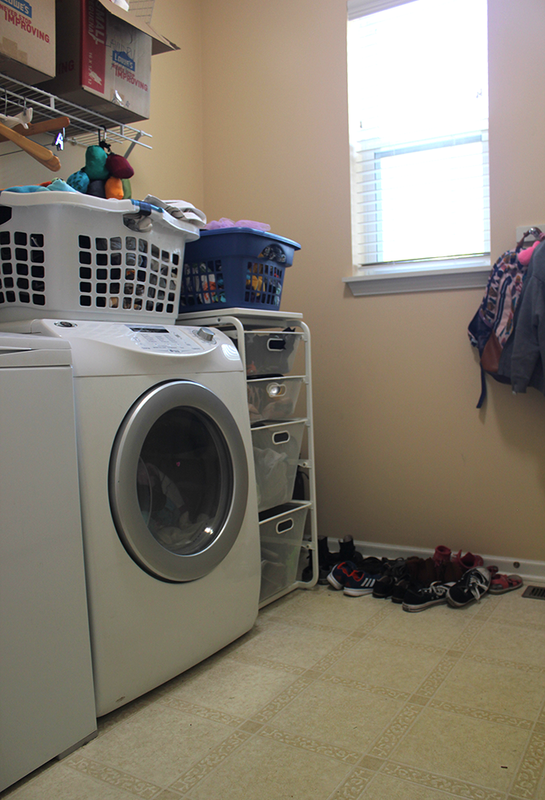 I'm hoping to get this room and a few more modernized to offset old appliances. 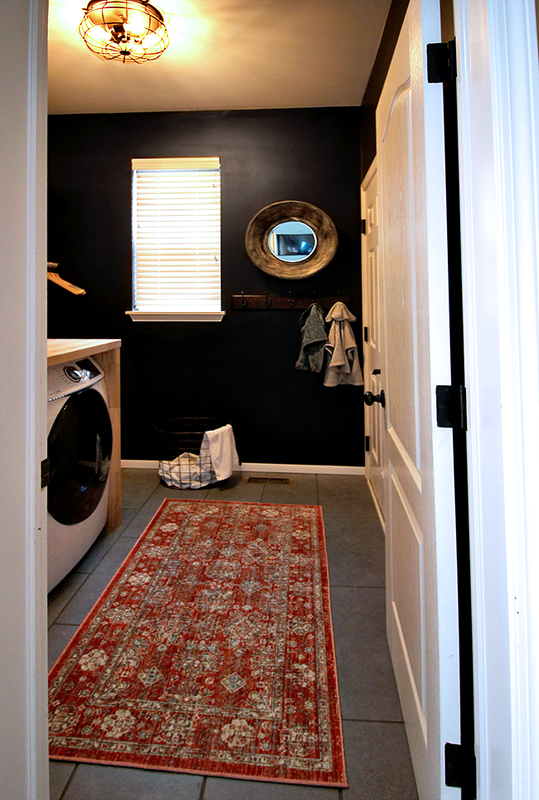 I love the look of dark paint for small rooms (did in in our bathroom too), because it makes them look bigger. 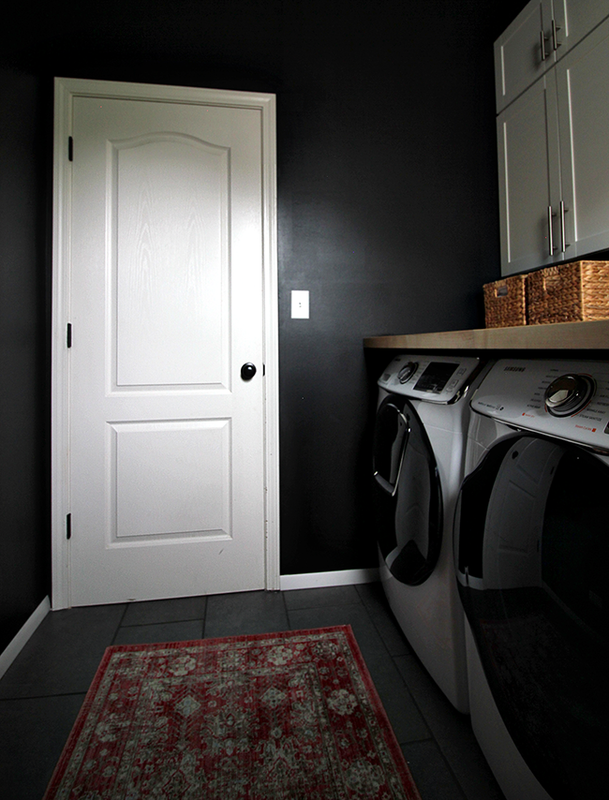 This surprises many people, because in larger rooms dark paint can make them appear smaller. But if a shade makes you nervous, I wouldn't recommend going with it. Painting is one of my least favorite parts of remodeling and I would never want to go with a shade I wasn't really comfortable with. I recommend getting several of the small sample cans and testing first.